Somebody calls autism a tragedy. Somebody kills an autistic person. Somebody doesn’t see how these two events are connected. I try to explain. I try harder. It happens again and again and again and somebody ‘splains it away. The topic here is devaluation. When it becomes commonplace to pair the words autism and tragedy, the pairing seeps deep down into the collective mind. When the puzzle piece becomes the recognized symbol for autism, the message comes over and over that there is something unfinished about the person. Something mysterious that the general public cannot be expected to understand. Now when someone hears “autism,” tragedy echoes in the background. Puzzlement reverberates. This one is not like the others. This one is out of our range of understanding and compassion. Somebody calls my request for respectful language and symbolism “political correctness.” Although this respect exists barely anywhere, it is portrayed as enforced, and therefore something that must be rebelled against. Somebody gets the bright idea to light buildings up blue for awareness. Everybody is more aware of the tragedy and the mystery and otherness. Nobody asks autistic people what this might mean for their futures. She wants a job, but the employer has heard that people like her are prone to violence. She wants to live on her own, but she carries the luggage stickered with claims of eternal childhood and helplessness. She needs a communication device, but someone knows this is pointless because she is empty. Someone has heard things. Out of frustration, she bangs her head. Somebody takes this as evidence, now she is locked away. Somewhere else, another child has been diagnosed with autism. He is forced to drink bleach, drowned in a bathtub, or smothered to death. This is the true meaning of tragedy. The voices are crying for understanding, not for the murdered but for their killers. The difficult, difficult lives they have led, autism is to blame. A puzzle piece is affixed to another bumper, the enigma of autism advertised, along with the pleas for an end to it, spewing out into the air as someone else drives on into the darkness. 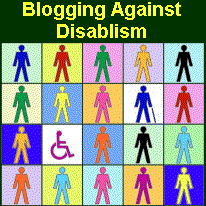 This post is offered for Blogging Against Disablism Day in honor of Katie McCarron (2002-2006). I have only one thing to say - great post! Well written, sad and necessary. I'm a (disabled/autistic) pediatrician who speaks to health care providers about disability and ablism in health care. I was hoping for your permission to show Top Shelf as such a clear demonstration of the medical and social models of disability. I would of course credit you as the creater. nightengalesknd, Thanks for your request. I am happy to have anyone show any of my videos. Going to check out your BADD post now! Thank you, Littlewolf, Sara, and sanabituranima! I'm here through BADD (yes, I'm taking my time). Your post is powerful, beautiful written, and illustrates the parallels between these situations well. Thanks for pointing out that a puzzle piece is used as a symbol for autism and what the problems with that are. Thank you for sharing your insight into a sensitive issue.